As far as the internals of the report were concerned, relative to last month things were generally skewed positive with six components rising and four declining. 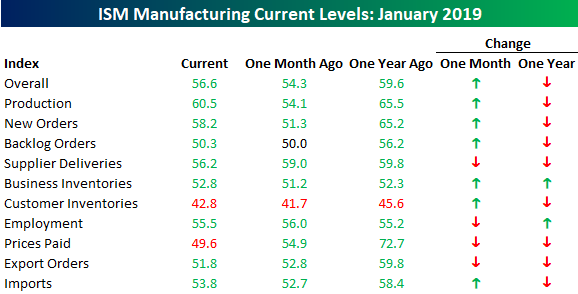 On a year/year basis, things remain weaker as Business Inventories and Employment are the only components that were up versus their levels last January. Perhaps the most notable trend in this month’s report was the decline in Prices Paid which fell to 49.6 from 54.9, which indicates falling price trends. The last time this component was below 50 was coming out of the Energy price crash in February 2016. The trend of falling commodities prices is also evident in the monthly commodity price survey found in each month’s ISM report. In this month’s report, respondents noted price increases in 11 commodities and declines in 15. This is also the first time since February 2016 that there were more commodities falling in price than rising. Comparing the results of the monthly Commodities survey to trends in y/y CPI shows that inflation is more likely than not to continue to trend lower in the coming months. 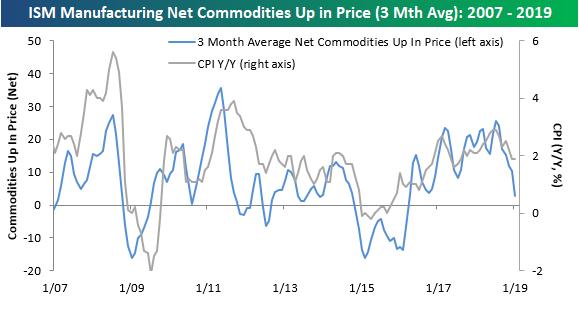 The chart below shows the three month average of the monthly net number of commodities rising in price. With this average currently at +2.7, it is the lowest since March 2016 when y/y CPI was running at a rate of 1.1% versus the most recent reading of 1.9%.